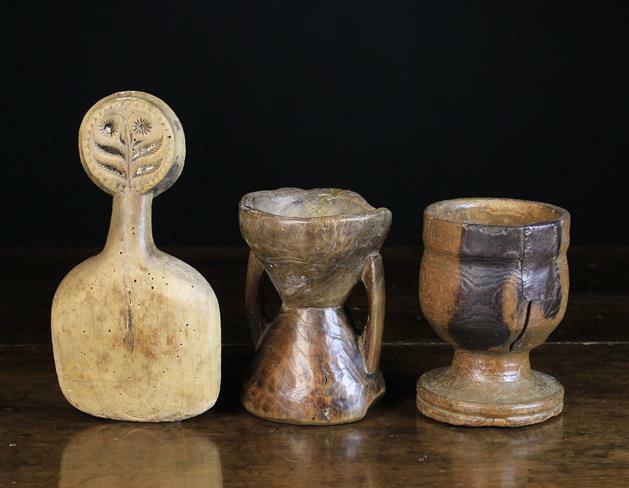 Four Pieces of Antique Treen: A Small Dug-out Diablo-shaped Spanish Garlic Mortar/Cup with straight sided bowl and two handles flanking a conical foot, 5 in (12.5 cm) in height. Another garlic mortar with waisted body and side handle. A 19th Century turned elm bowl with side mounted pole handle, ring turning and raised foot, 4 in (10 cm) high, 12 in (31 cm) wide. And a pestle/spoon. 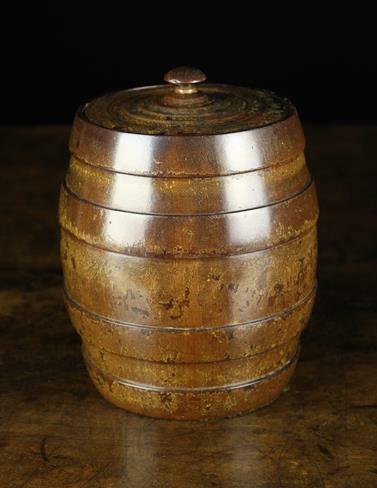 A Large Lignum Vitae Barrel-form Tobacco Jar, possibly 17th century. The sides turned with four 'hoop' bands and having a tightly fitting lid with concentric ring moulding to the top around a central mushroom finial. Marvellous patina and degraded original varnish (so valued by the late Jonathan Levi as original finish - see Chapter 19 'Surfaces' of his classic book 'Treen for the Table' for such a degraded finish to an 18th century lignum vitae coffee grinder (Plate 19/7) for identical (degraded) original finish),. The underside of the base with later green baize. 7 ins (18 cm) high (to top of finial). 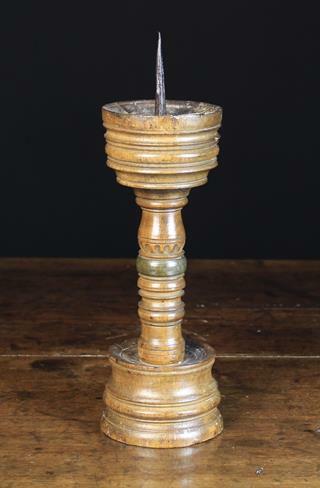 A 17th Century Treen Pricket Candlestick. The iron spike centring a slightly dished top above a turned circular block and decorative stem on multi-turnings enhanced with chip craving and centred by a green stained band, leading down to a round block base, 13 in 933 cm) in height [From The Sam Wolsey Collection, marked with inventory numbers]. 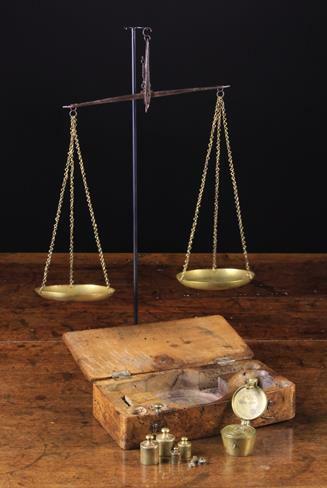 A Set of Antique Weighing Scales & Weights fitted into a dug out fruitwood case and incorporating a nest of stacking cup weights. The case 2 x 8½ x 4¼ in (5 x 21.5 x 11 cm). 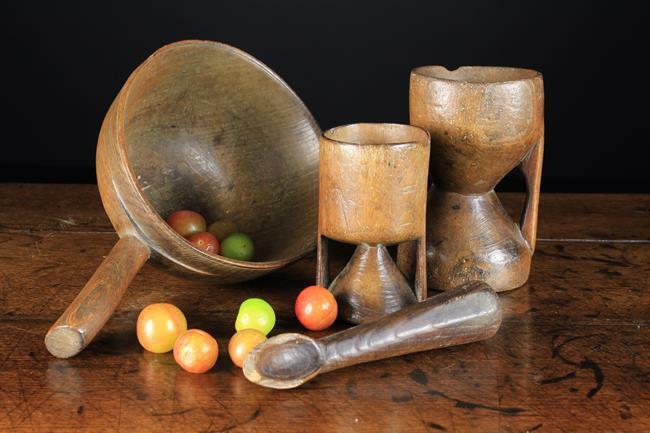 A Rare 18th /Early 19th Century Oak Pestle & Mortar of good colour and patination; the mortar displaying pole lathe turning lines, with squared flange rim for setting into a flat surface, complete with original oak pestle. 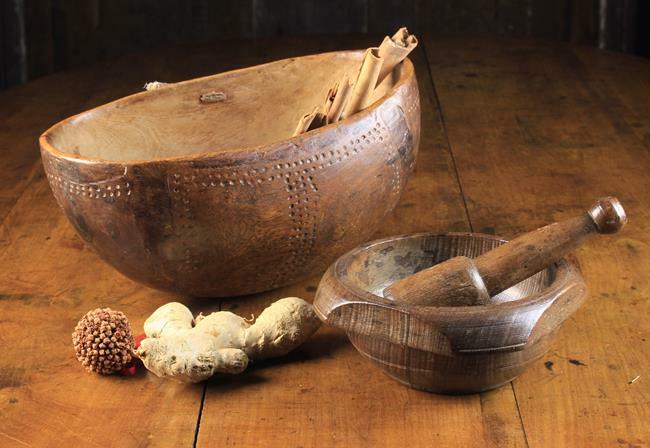 7½ ins (19 cm) dia (mortar) and 6 ¾ ins (17.5 cm) long (pestle). And an Ethnic Wooden Milk/Cow's Blood Bowl of oval hemispherical shape with simple 'punched' decorative bands and a woven cord hanging loop; Pokot/Turkana tribe Northern Kenya 12 ins (30.5 cm) wide x 5 ¾ ins (14.5 cm) deep. Good patination and colour, probably late 19th / early 20th century. 10 ins (25.5 cm) wide. Three Pieces of Treen: A 17th century turned mortar on a pedestal foot with sheet iron repair to the cracked bowl, 6 in (15 cm) high. An early 19th century sycamore scoop having a short handle with a roundel to the end; one side carved with flowering plant butter press, the other with initials, 9½ in (24 cm) in length, and a dug out double ended salt/mortar with twin handles 6 in (15 cm) in height. 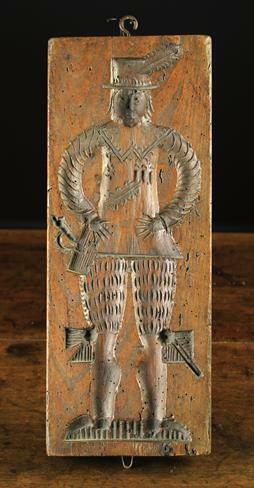 A Large Late 17th/Early 18th Century Ginger Bread Mould -double sided with a crowned King carrying a scepter to one side and a crowned Queen holding a fan to the other. Approx. 18 ins (46 cm ) tall, 7½ ins (19 cm) wide, 2 ins (5 cm) deep. A Late 17th/Early 18th Century Ginger Bread Mould with a finely dressed gentleman to one side and a lady with a long pleated dress carrying a sprig of foliage to the other. Approx. 17 ins (43 cm) tall, 6 ¾ ins (7 cm) wide and 1¼ ins (3cm) deep. 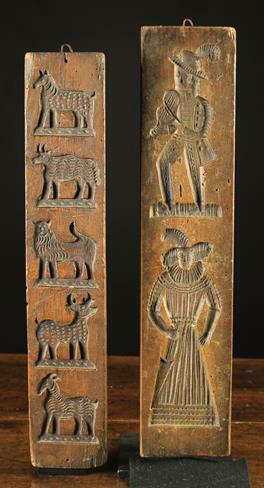 Two Late 17th/ Early 18th Century Ginger Bread Moulds; one double sided depicting men on horseback and a cockerel to one face, and a well dressed lady and gentleman to the other, approx. 21½ ins (54 cm) tall, 4¾ ins (12 cm) wide, ¾ in (2 cm) deep. The other showing a variety of animals to its one face, including a stag, lion and goat. approx. 20½ ins (52 cm) tall, 3¾ ins (9.5 cm) wide, 1 in (2.5 cm) deep. A 19th Century Breton Porte-cuillères hanging from a retractable chain mechanism; the casing cast BTV SG DG No 1 LR. The turned chestnut hanging spoon rack having mushroom capped spokes radiating from a moulded circular hub above a cross handle, on a knopped & finialed central stem ornamented with bands of brass studs. The rack 17 in (43 cm) in length.